You can obtain items from Treasure boxes, as drops from enemies, and as rewards from quests. The Rank and parameters of obtained equipment and items will vary. In the case of weapons, this affects abilities related to its attack, so when obtaining a new weapon, it may be best to check its parameters, and equip one that suits your battle style. Parameters vary not just for weapons, but for armor, outfits, accessories, and processors. 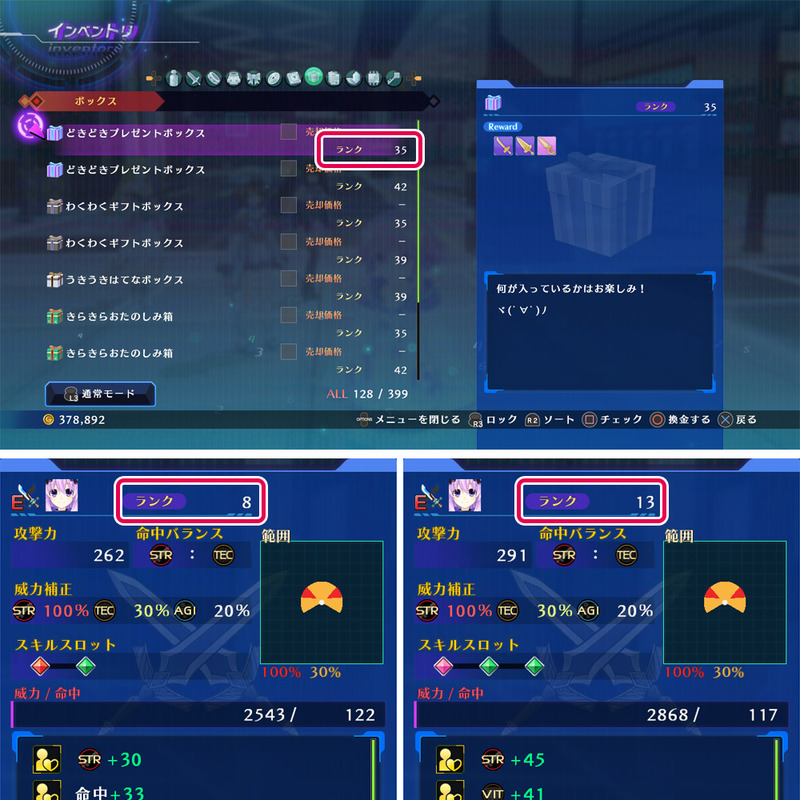 There is a parameter called "Rank" for equipment items or items called Boxes. The higher the rank, the higher its strength and other abilities. Items dropped by enemies will have a rank according to the enemy's level. Items bought at shops will have a rank according to the Technology Level. Items obtained through Treasure chests within dungeons will have a fixed rank. Items sometimes have a rarity value attached to them. The rankings from lowest to highest are: Rare > Super Rare (S Rare) > Ultra Rare (U Rare). 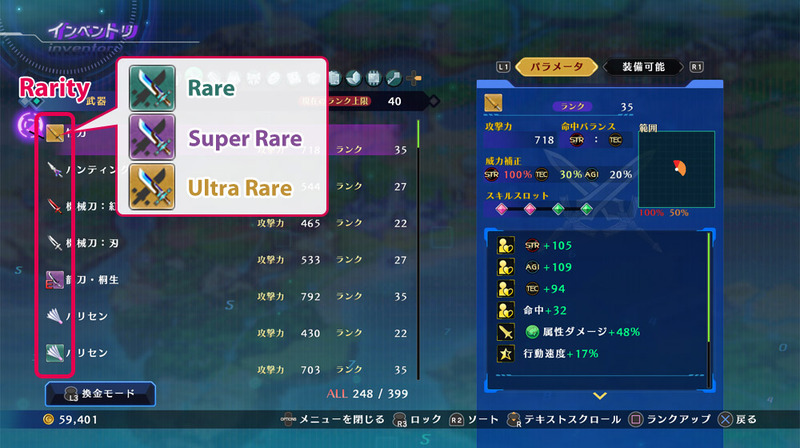 The higher the rarity, the harder it is to obtain, and in the case of equipment items, their abilities will be higher. Aside from the basic stats of an equipment item, they each have special characteristics such as increasing [STR] and [INT] parameters, giving resistance to status effects, strengthening special skills, and others. As the rank increases for an item, there may be more characteristics attached to it, and their effects may increase as well. Two of the same item can end up with different characteristics, so even if one has lower base stats, it may blossom into one with more desired characteristics as it ranks up. Weapons affect stats related to attack power. ① Attack The base attack power the weapon holds. The higher this number is, the stronger the attack. ② Accuracy Balance The parameter related to accuracy. The closer the position of the two displayed parameters, the higher the accuracy. 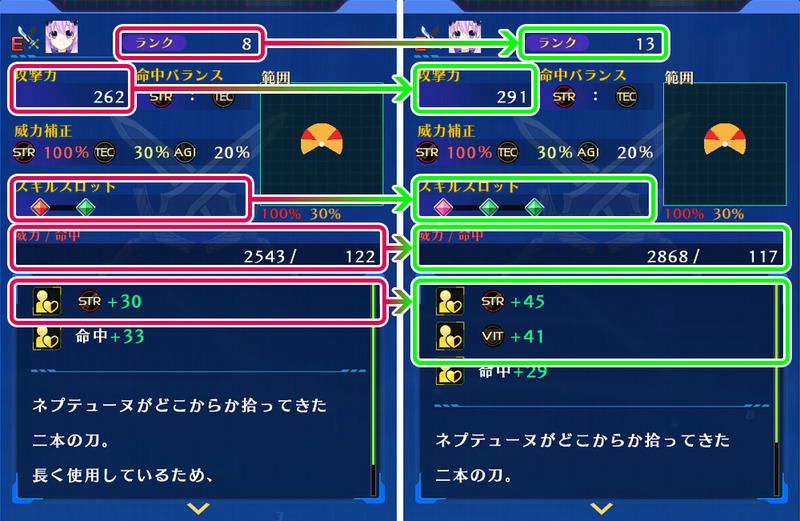 ③ Power Addition The parameter of how much additional attack is added and its efficacy. Efficacy is shown as a percentage. The parameter with higher percentage has a stronger effect on the attack power. 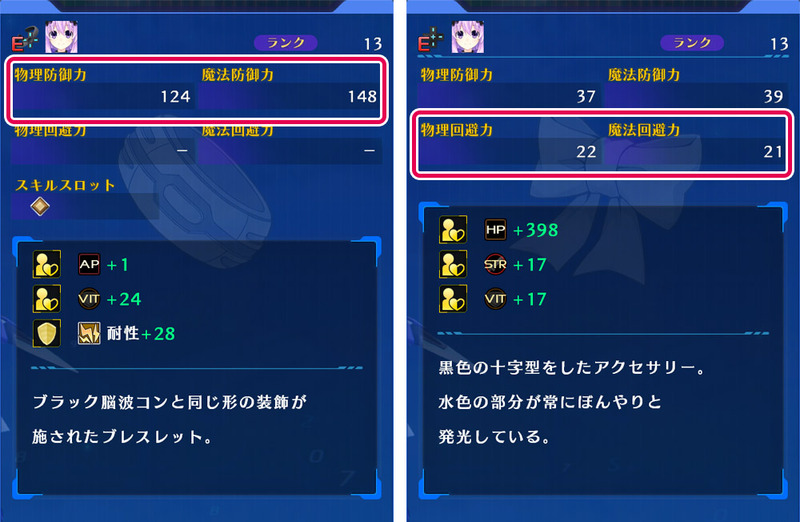 ④ Skill Slots The amount and kind of Combo Skills which can be set. The Skill Slot icon's color and the type of Skill's color are linked. Accuracy The power and accuracy when equipped. This displays the addition effect to the base Attack and Power parameters. Accuracy not only affects how easily attacks hit, but also the stability of damage output. The higher it is, the easier attacks hit, and damage is more consistent. ⑥ Radius The attack radius the weapon has. This is the radius of the Combo Skills. 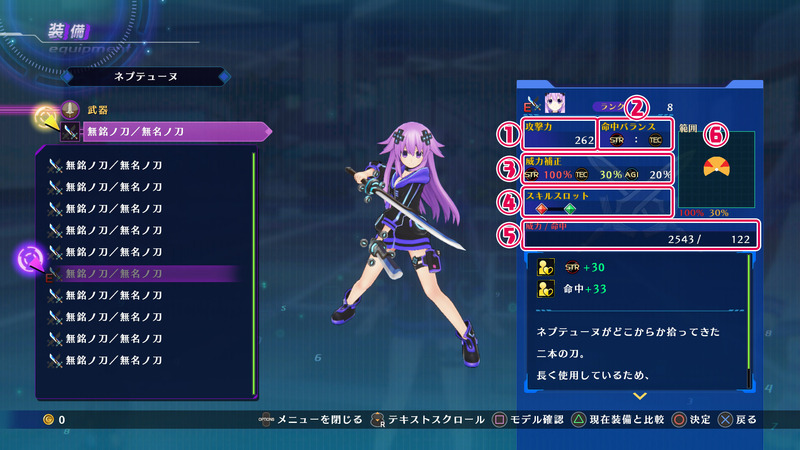 The damage efficacy is displayed as a percentage. Enemies in the areas with a higher percentage will take greater damage, while those in areas with a lower percentage will take less damage. By equipping Armor, abilities related to defense will increase, or be granted additional characteristics. "Physical Defense" and "Magic Defense" indicate resistance against an enemy's physical and magical attacks. The higher the defense, the less damage you take. "Physical Evasion" and "Magic Evasion" indicates how evasive you are against an enemy's physical and magic attacks. The higher the evasion, the lower the stability of an enemy's damage output, and it increases the chance of an attack missing. "Skill Slots" show how many Defense Skills can be used. If you have 2 or more Slots, it is possible to use multiple Defense Skills at the same time. 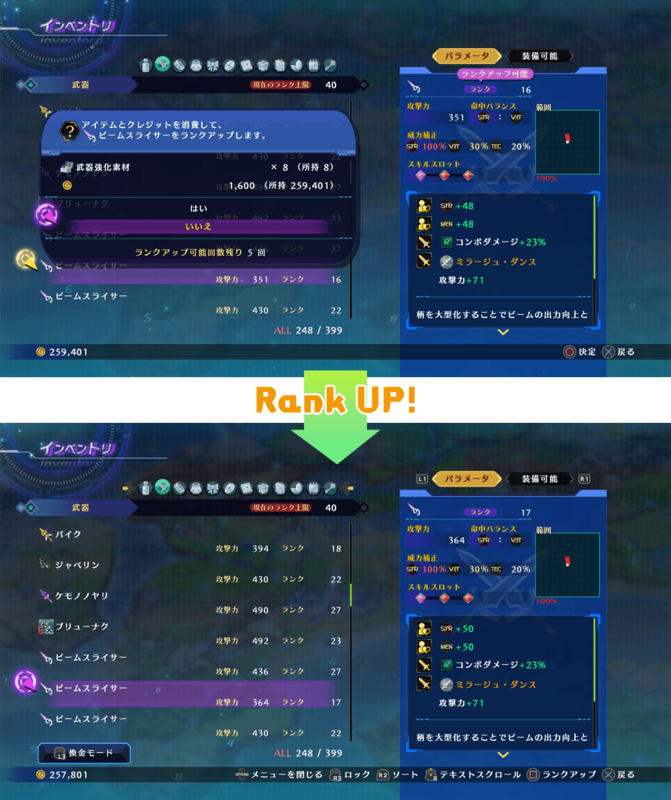 You can increase the Rank of an equipment item by using special materials and Credits. The limit of how far you can raise a Rank is related to the Technology Level. Each Item has an amount of times it can be strengthened, and it is not possible to raise its Rank any higher than this amount. ※Certain items do not have a restriction on strengthening. Technology Level is the level of technological advancement within Gamindustri. It usually affects the Rank of equipment items bought from Shops, and the higher the rank, the higher parameters the item will have.